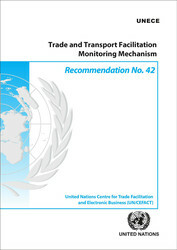 Recommendation 42 on Trade and Transport Facilitation Monitoring Mechanisms (TTFMM) addresses issues related to institutional arrangements and methodology in designing and implementing TTFMM. It is an important contribution to UNECE’s suite of Trade Facilitation recommendations and guidance material. Download the Publication ECE/TRADE/437 in English.